As most fiber optic cable installers know, the labor and costs associated with accessing and grounding a traditional armored fiber optic cable is pretty high. Because the armor is usually made of aluminum foil or steel, so grounding is a must for all installations. 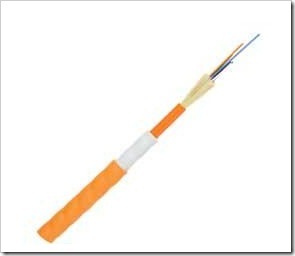 On April 6, 2009 Corning Cable Systems introduced its MIC DX serials all-dielectric armored fiber cable. This completely removes the need to ground the cable. As described by Corning, the cable core is protected by a flexible all-dielectric armor, that offers more than 4 times the crush protection compared to regular unarmored fiber cables. The cable also has a smaller outside diameter. This all-dielectric armored fiber cable is designed to eliminate the need to ground the cable, offer greater tensile strength than interlocking armored cables. 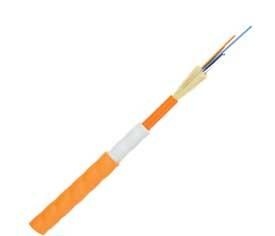 Absolutely no metallic components are used in the cable, this also simplifies the access to the fibers inside. This all-dielectric armored fiber cable is offered in single mode, 62.5um multimode, 50um multimode and even hybrid (single mode and multimode mixed) fiber configurations. They can be used for riser (OFNR and FT-4), plenum (OFNP and FT-6), general purpose for intrabuilding backbone and horizontal cabling installations. These cables are available with Gigabit Ethernet and 10-Gigabit Ethernet performance.